Length: 2 hrs. 30 min. Most people think the average teenager isn’t capable of much beyond hanging with their friends and wasting time. But Zach Hunter isn’t your average teenager. And he’s hoping to show you that you’re not either. Zach has been trying to end slavery around the globe. Most people (maybe even you) think that slavery has been over for a long time. But sadly, there are more people bound in slavery now than at any of the times we read about in our history books. 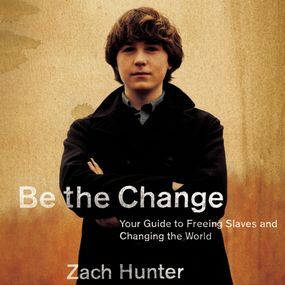 Now Zach is working to end slavery and free the men, women, and children who are being held against their will. He’s even found some friends in the fight, including Jon Foreman of Switchfoot and Leeland Mooring of Leeland. Just look around the world and on the news and you’ll find that there are plenty of things wrong with our planet—homelessness, hunger, global warming, AIDS…the list goes on and on. And we usually look at these problems and decide they’re too big for us to do anything about. But Zach is proving that one person can make a difference. And in his book, he’ll reveal the elements needed to make amazing changes in your world. In the end, he hopes you’ll find the thing you’re passionate about—and start making changes!